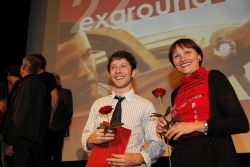 On Sunday, November 22, 2009, exground filmfest finished successfully. In the past ten days, the films from all over the world found huge acclaim with the international audience who travelled to the Hessian state capital Wiesbaden for the 22nd time already – for the most important platform for the German independent film. This year, the festival lured around 2.000 viewers more into the cinemas than last year. exground filmfest had a total of 14.000 guests, 11.000 of which visited the film screenings. 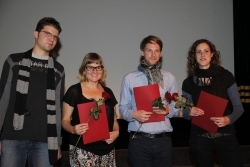 In two screenings, the audience decided on this year’s winners of the GERMAN SHORT FILM CONTEST. The final vote took place on Sunday in the sold-out Caligari FilmBühne. The first prize went to Michael Ester’s film IL GIARDNIO. The award is endowed with 3.000 Euros and sponsored by the Cultural Office of the state capital Wiesbaden. BOB by directors Jacob Frey and Harry Fast reached the second place, endowed with 2.000 Euros, sponsored by the BEWEGTE ZEITEN film production GmbH. The third prize went to JUDAS AND JESUS. Directors Olaf Encke and Claudia Romero received 1.000 Euros, again sponsored by the Cultural Office of the state capital Wiesbaden. In the course of the award ceremony, the winners of the other exground contests were announced as well. The jury of the international youth film contest gave the only feature film award of exground filmfest to the US entry MY SUICIDE by David Lee Miller. The youth jury explained their decision as follows: „The unique collage of documentary and staged images, of old film snippets and animations, accompanied with expressive music, has carried us over. This experimental and extraordinary execution turns this film into a work of art that provides food for thought not only for us adolescents.“ Thanks to the state capital Wiesbaden, the award is endowed with 450 Euros; certificate and cheque were accepted by leading actor Gabriel Sunday. The international ON-VIDEO CONTEST was won by Dutch cartoon NOTEBOOK (NOTE­BOEK). The professional jury, consisting of last year’s winner Marion Pfaus, as well as Martin Gessner and Jürgen Kittel, was convinced by the complexity and personal touch of the Dutch short film. Director Evelien Lohbeck accepted the award of 1.500 Euros in person, which for the first time has been sponsored by the exground circle of friends. Honorary mentions from the jury went to MISS KONG (director: Minna Suoniemi), SECRET ENCOUNTER (director: Danilo Vogt), and WAGAH (director: Supriyo Sen). Already last Sunday, the audience decided on the winner of the WIESBADEN-SPECIAL SHORT FILM CONTEST, which is exclusively reserved for filmmakers from Wiesbaden. 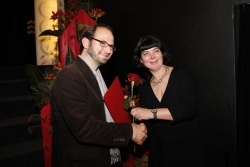 In the course of the award ceremony, director Kolja Erdmann was honoured for his film DREISSIG. Andrea Wink from the festival team presented the certificate and the prize money of 500 Euros, sponsored by the Wiesbadener Kurier newspaper. This year again, exground filmfest participated in the international contest BETTING ON SHORTS: MORE THAN A EUROVISION OF SHORTFILM. 12 short films were shown simultaneously in just as many cities. In every city, a jury elected the winner, while the audience could place bets on their favourite. In Wiesbaden, the British film SECTION 44 by Daniel Wilson was the winner, while MEMOTECH by Marianna Mørkøre & Rannvá Káradóttir from the Faro islands was the winner of the international contest. Following the award ceremony, the festival audience and the filmmakers celebrated friskily in the foyer of the Caligari FilmBühne. The Rock ’n’ Roll Quartett laid the ground, DJ Ras-Andi then took over the musical design of the closing party. The date for the next exground filmfest is already fixed. Between November 12 and November 21, 2010, numerous international filmmakers will present their works in Wiesbaden vorstellen. Until then, the filmfest will present a monthly „exground film of the month“ in the Caligari FilmBühne, on December 16 this will be Quentin Tarantino’s INGLOURIOUS BASTERDS. Doris Day bei der Matinee und am Abend Glamour, Glamour, Glamour! Doris Day war in den 50er- und 60er-Jahren der erfolgreichste Hollywoodstar. Die Dokumentation WHAT A DIFFERENCE A DAY MADE – DORIS DAY SUPERSTAR (12.00 Uhr Caligari FilmBühne) spürt der Legende am letzten Festivaltag nach und gibt schon mal den Rhythmus für den Abend vor. Das Highlight des Festivals, der DEUTSCHE KURZFILM-WETTBEWERB eröffnet den Abschluss der 22. Festivalausgabe. Das Publikum ist die Jury, und entscheidet wer die Preisgelder mit nach Hause nehmen darf. An diesem Abend wird aber nicht nur der beste deutsche Kurzfilm auf 35 mm gekürt – alle Preisträger der vergangenen neun Festivaltage werden verkündet und mit Preisen überschüttet. Bis zum nächsten Jahr und der Eröffnung des 23. exground filmfest! Als kleiner Trost für alle exground-Liebhaber: Einmal im Monat präsentieren wir in der Caligari FilmBühne den exground-Film des Monats - am 16. Dezember INGLOURIOUS BASTERDS!